Emmett and Liliana camped out in the back yard with David this weekend. They had a walkie talkie in the tent with them and while David was still inside finishing up some work, Emmett kept using it to call inside and ask questions or share random thoughts and comments. When David first gave the kids the walkie talkie, he told them that when they are all done talking and want to let the other person know that they are ending the conversation, they can say, "over and out." Emmett didn't quite remember the phrase, so he would finish with "Good night. Love you. Out and in." It took us a few minutes to realize what he was saying and why, but it was so cute and sweet that we couldn't bring ourselves to correct him right there and then. Love that kid. For Valentine's Day, David and I sat down with the Liliana and Emmett and scheduled a date with each of them over the following few weekends. Liliana and I went to see a movie (Paddington Bear) together and Emmett asked to go to Dairy Queen for treats, followed by perusing a store nearby. Liliana scheduled a swimming date with David, and Emmett is going with David to see a movie. As the older kids began to go on their dates last week, Edison, the 2 year old decided he wanted to go on one as well. 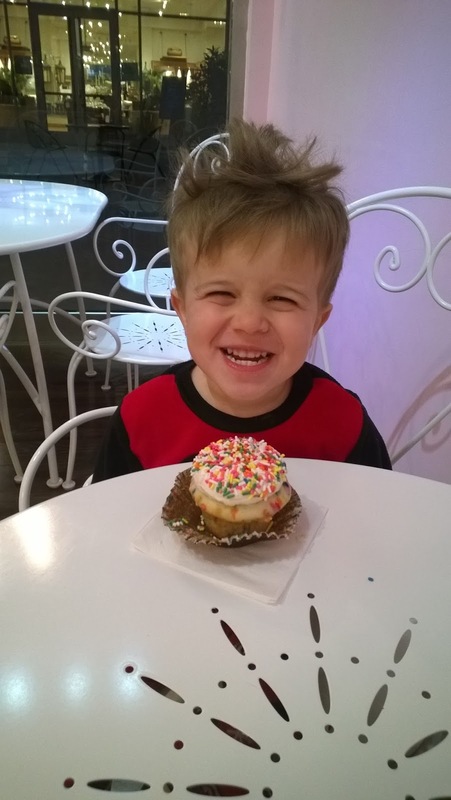 When asked what he would like to, Edison said, "Get a cupcake." I told him he and I would go out for a cupcake on our date this weekend. Almost every morning and after most naps this past week, Edison has awakened saying it was time for his date and his cupcake and has been sad when he found out he still had to wait. This morning he woke up crying about it, and luckily I could tell him we'd be going after nap time and dinner. 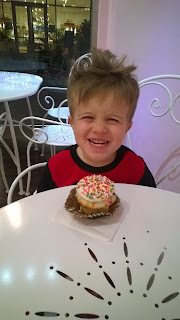 When we parked at the mall where there is a cupcake shop and I opened his car door, Edison giddily said, "I'm so excited!" He was so happy to finally get out on his date. 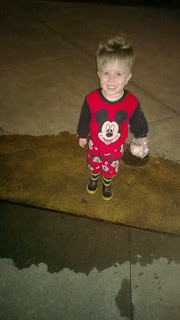 We wandered our way through the mall towards the shop and Edison stopped to check out fountains, lights, store displays, and even the sparkly design swirling through the floor. Once inside the shop, he picked out the most frosting and sprinkle covered cupcake available. He then proceeded to eat the cupcake... one sprinkle at a time - hopping out of his chair to pick up each sprinkle he dropped (which I quickly snatched away before he could put them in his mouth). After awhile, he decided he wanted the cake more than the frosting, and started eating bites from the bottom. He made it about halfway through and then we took the rest home for later, stopping to check out anything eye-catching on the way out - including a puddle to jump in outside. Luckily Edison was ready for the puddle, since he had put his rain boots on to go with his Micky Mouse PJ's that he wouldn't allow me to change before leaving the house. To top off his date outfit, his hair was sticking pretty much straight up because David had blow-dried it that way yesterday and Edison didn't want it combed today. He had a great time and I enjoyed being able to give him my full attention and let him lead us along in our activities, so I'd say our first official date was a success.